I'm giving a brief apology for the lack of posts this month. Life has been insanely crazy. We had a bout of strep throat followed up with a nasty upper respiratory virus. Of course, we weren't sick at the same time. We all took turns, and I think (*hope*) that we are all on the mend and life will go back to normal! Anyhow, being that I missed last week's post, this week is merged/double post. Today's featured items are baby food jars and containers. (Both the glass jars and the plastic containers). We have also used both containers to hold smaller arts and crafts supplies. These votive holders are different from the ones we made. (We painted ours) I found them over at Back Stitch Baby. I think the tutorial says bullion cube jars, but they would work out brilliantly with baby food jars too! Aren't these photo snowglobes adorable! 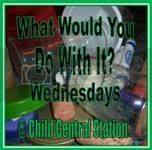 I found the post and tutorial from Lori over at It's the Small Things. I found this tutorial over at Thrifty Fun. 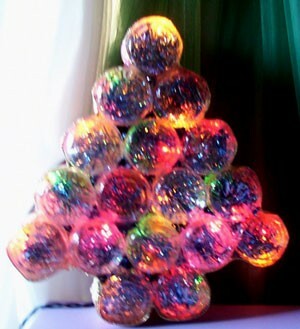 I also remember my aunt making these cool trees when I was younger. She made the version with the lights, but I LOVE the idea of an advent calendar like I found over at Naptime Crafters. I know there are a lot of other neat ideas out there, so please link them up! I really didn't have much success in finding ideas for the plastic containers, so show me what you've got! Do you have a great idea or post that you can share using baby food jars or containers? If so, please join in linking up! If you have been featured and feel inclined, my featured button is available to grab from the sidebar. Next week, I will feature my favorite link up and I'll be posting about tissue boxes! Hopefully, I'll be on time! Totally forgot to get this done. But, now I'm thinking about what can be done with a plastic baby food jar, and I have an idea brewing in my head. Amy, I was just looking in your past linkies. I think you should leave them open much longer. Maybe forever. They are themed linkies. Meaning, someone can come up with an idea how to reuse a thing in 6 months and they couldn't add it to your linky. If you leave them open, you'll be getting more participation and you'll end up creating collections of different ideas for reusing a same object. Thanks for the tip Michelle. I did have them set to be open for at least a month, but it is easy enough to go back and reopen them. I'd love to continue to see more ideas! I would also suggest that you go to Feedburner and open an accout. Many people (including me) will click on mail subscription if it's available. That's another way to get more followers. And get more readers.